Apart from the food offerings of longtime stalwart, Outback Restaurant, we admit we’re not that exposed to Australian cuisine. 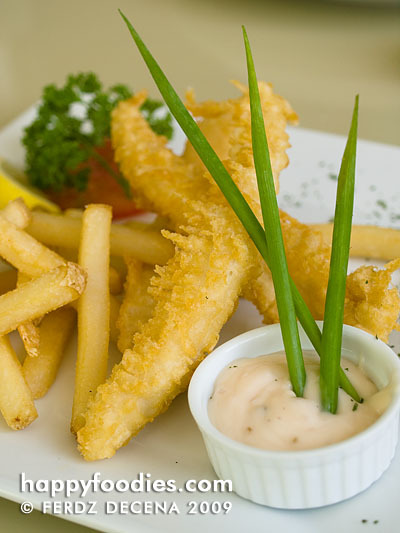 Oh, we have images of Australian icons in our heads but still, we asked ourselves, “what is Australian cuisine?” Googling the topic reveals a bit of insight like the fact that traditional Australian cuisine borrows heavily from the British tradition (think fish and chips, pies, et al). The modern iteration, however, is not as easy to define as understandably, their cuisine is influenced by and infused with other cuisines, especially of the people who have been transplanted to the continent like Asians. 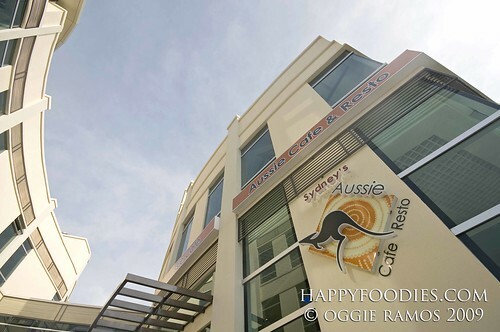 Follow the Happyfoodies as they venture to the southern part of the metropolis to get a taste (and a flavorful idea) of Australian cuisine at the appropriately-named Aussie Café and Resto. 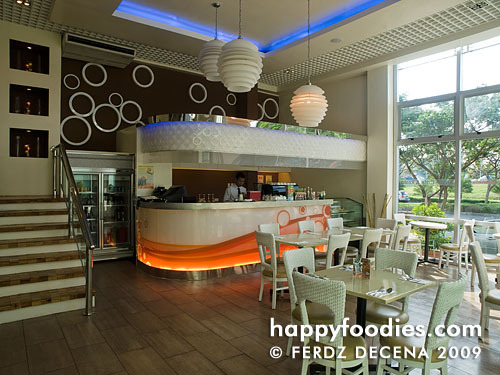 Lagal[og] said: The café is located in a building of its own near the block of restaurants along Filinvest Avenue, Alabang. The façade looks very modern from the cream-colored concrete wall to the glass enclosures. Stepping inside, it’s airy and light, to a large extent, helped by the floor to ceiling windows of one section of the café. It gets pretty warm staying near the windows during mid-afternoon (something that will be addressed by the owners pretty soon) but the windows add to the mood of the place as one can have a quiet meal or a coffee break and see the quiet, tree lined street outside. Ironwulf said: I must admit that the location is quite tricky to find if you are not familiar with the place. The building is modern and has large windows so you could clearly see from the inside. The interiors are modern; I actually like the white and bright orange theme with light blue accents, designer chairs and lamps and the counter that actually looked like a bar which the owner admits some customers thought of as well, especially at night. There’s a mezzanine floor as well that can be used for private functions. The Resto can sit around 70 people without being cramped. 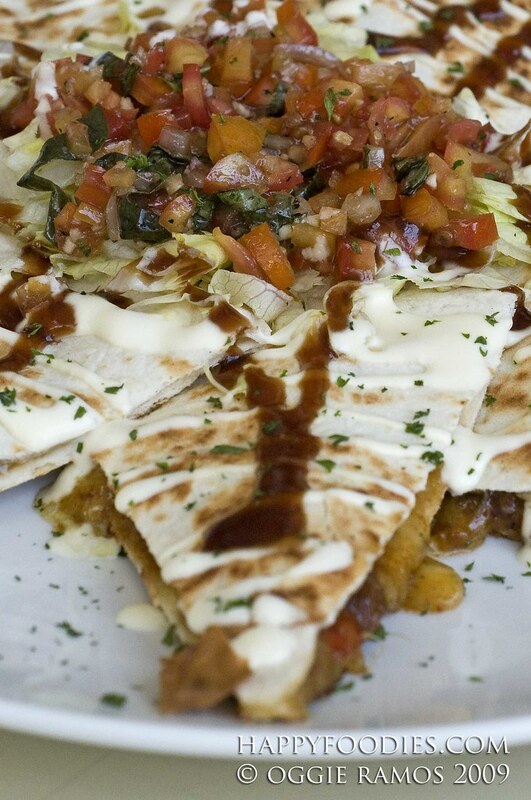 Lagal[og] said: For starters, we had the Beef Quesadilla which is the café’s take on a traditional Mexican fare. The addition of rich barbeque sauce on top of mayo add a fresh twist to this appetizer which is already chock-full of minced tomatoes, beef, mozarella and bell peppers. It’s a bit strange at first, being used to the salsa sauce used in traditional quesadilla, but it kind of grows with you. The Aussie Fish and Chips use tender fish strips very lightly battered so it’s not at all oily. I only wish the serving was more generous but otherwise, it’s good for starters. Ironwulf said: I like my quesadilla more on the salsa and spicy side that’s why when I tasted their Beef Quesadilla which is a bit on the sweet side due to the BBQ sauce, I was actually looking for some Tabasco. But this is a matter of preference. However, their Pepper Tenderloin Steak was a showstopper. That piece of meat done medium well was delectably grilled. There’s a slight crunch on the outside and really flavorful juice oozing out once you start chewing on it. Add in some pepper sauce and full-bodied mashed potatoes and I was really in for a real meaty and tasty treat. Lagal[og] said: Apart from the Pepper Tenderloin Steak which was also my hands-down favorite, I also liked the Chef Bernie’s Ribs. 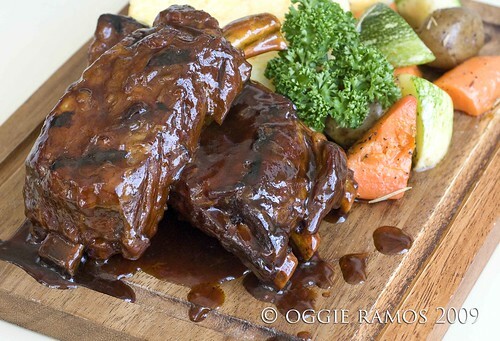 These were served with rice and veggies on a wooden board that resembles a chopping board but in truth, the ribs needed no extraneous chopping or cutting. Using just the fork and spoon, the meat just falls off the bone. I would just take a chunk and swirl it in the generous barbecue sauce for a very flavorful, very filling bite. Ironwulf said: Chef Bernie’s Ribs was true to its description – mouthwatering – just by looking at it. But I thought the sauce used was the real key to its flavor. 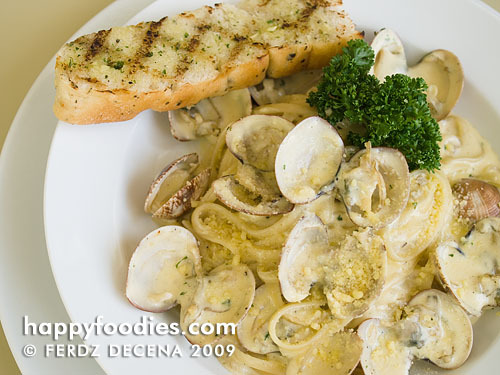 If one want to try a taste of seafood, their Vongole Pasta is a good choice. This fettuccini pasta with really creamy and medium flavored white sauce topped with Parmesan cheese and clams (this last ingredient is the accent flavor) has become my favorite. The garlic bread that comes with it is really good that I could eat it on its own. 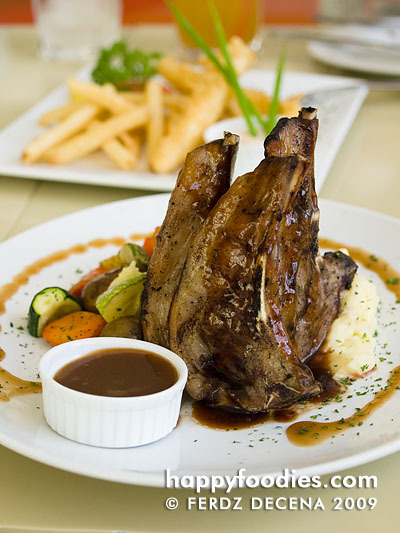 The Australian Lamb Racks, which came in a bit later, was interestingly presented with slices of lamb meat standing together beside mashed potatoes and oven roasted veggies. With the overwhelming flavor of the Pepper Steak and Chef Bernie’s Ribs, it was a bit hard to place this one. Definitely, the meat was tender and for a lamb dish, it was prepared well as it wasn’t fishy as some lamb meals are done. Lagal[og] said: It’s refreshing to see more and more establishments that serve non-commercial iced teas and this place is one of them. 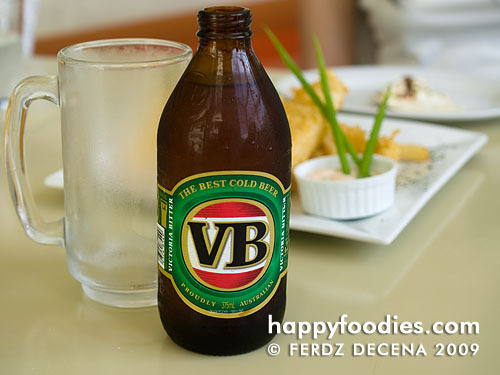 For those who’d want to have beer with their meals, Victoria Bitter or VB is available. The beer is a full strength lager and ideal for those who want their beer on the bitter side. 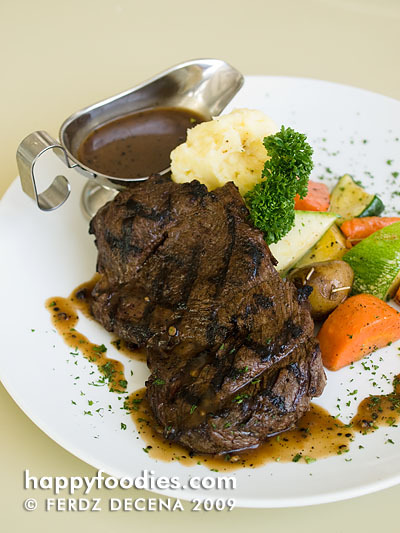 Served on chilled mugs, it goes well with the ribs and steaks as well as fish and chips. Ironwulf said: I must commend the establishment for having their signature iced tea which isn’t too sweet but richly flavored. 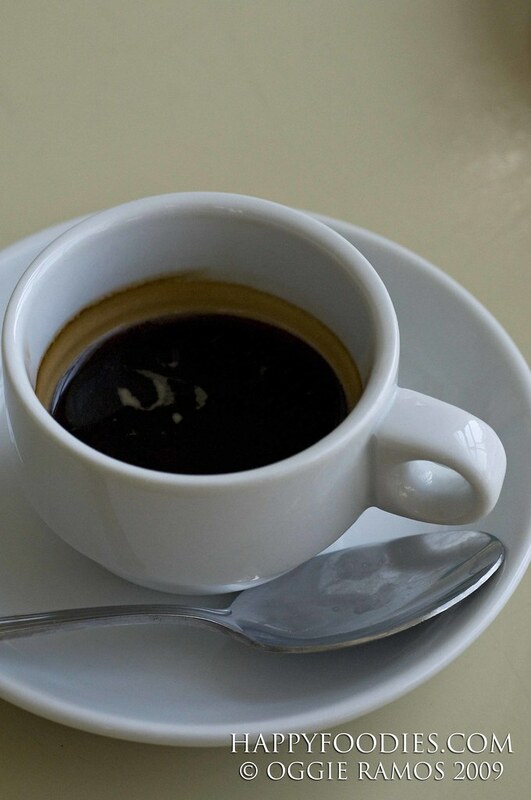 Australians have a very eclectic taste in coffee since they have a very rich coffee culture. Unfortunately I’m not an expert on coffee so I only got to try their Mocha Frappe, the rich flavor of which I really liked since it is not too sweet. Also, I got to try their Hot Choco which I find less stellar. It’s like a creamier version of Swiss Miss. 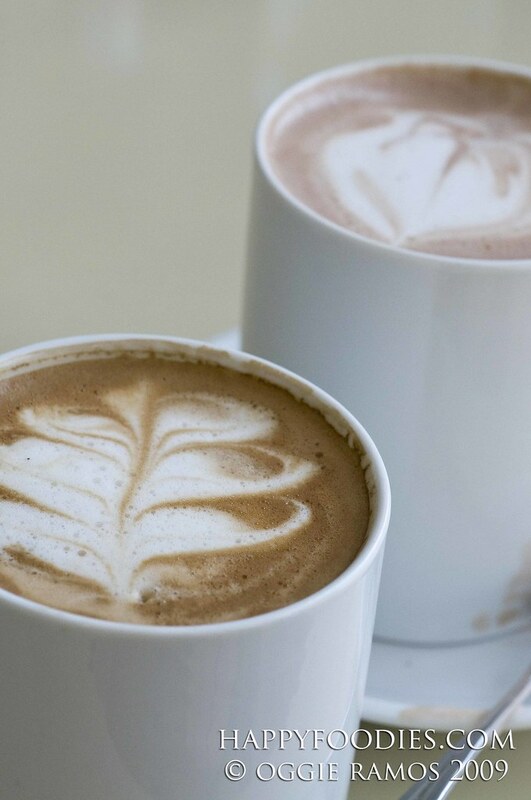 Lagalog said: Aussie Café prides itself for its coffee and one taste on offer can explain why. Inspired by the sophisticated coffee culture of Australia, the owners, the Choa family, and their Australian-based Filipino chef, Bernie, intended to give the Pinoys a taste of how Aussies want their coffee. To achieve that, the beans used here are sourced from Australia. I had three kinds of coffee – Short Black Coffee, Café Latte, and Mocha Frappucino. Had we had room for desserts, I’d like to think the coffee would be a perfect match. The coffee has a very smooth, clean taste, which was very much evident in the shot of Short Black. 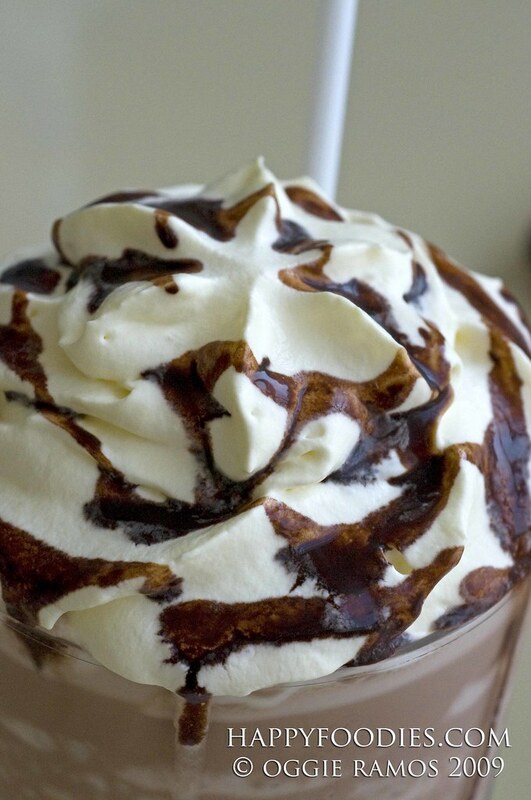 Those who want a decadent serving would likely opt for the loaded Mocha Frap.